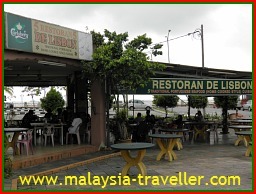 The Portuguese Settlement Melaka, or Kampung Portugis, is located a couple of kilometres outside of Melaka city centre in an area known as Ujong Pasir and is home to a small community of around 1,000 people descended from early Portuguese settlers. In the 1930s, the British Resident, at the request of a French missionary, allowed the establishment of a fishing village of wooden huts on an area of swampy land next to the sea. It was originally called St. John's village and became a bastion for those with Portuguese ancestry to preserve their religion, language, culture and traditions. Malacca was a Portuguese colony from 1511 to 1641 and Portuguese men settled here and married Malay women from the area and from Sumatra. Goa was also a Portuguese colony at this time and many of the Portuguese men had mixed Indian blood. 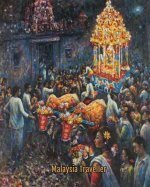 In the following centuries further mixing with Chinese, Malays, Indians and others produced a mixed Eurasian community. Their language is Kristang (cristao), a creole mixture of archaic Portuguese from the 16th century combined with Malay elements and found only in Malaysia and Singapore. They are devout Catholics and they have strived to maintain some of their traditions such as food, costume and dance. Today the settlement, sometimes called Mini Lisbon, comprises a few streets with names like D'Alberquerque, Sequera, Eredia, D'Aranjo and Texeira. 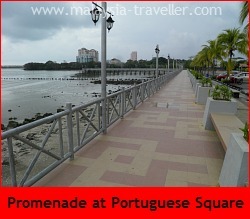 At its heart is the Portuguese Square (Medan Portugis), which comprises a courtyard with a number of seafood restaurants, a couple of bars and a small museum. An area in front of the square has been reclaimed to make space for a car park and a new hotel. I preferred the more rustic look that the area had in the old days before the reclamation. The place is fairly dead during the day but the restaurants get busier in the evenings and at weekends when cultural shows are staged. Once a year, on 29th June, they celebrate the Feast of Saint Pedro with dancing, music and banquets. 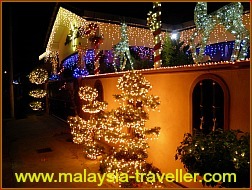 Christmas is the other main occasion when the residents decorate their houses with coloured lights, Xmas trees and Nativity displays. This draws large numbers of visitors. Food is the top attraction here for most visitors. Typical dishes include Portuguese style ikan bakar, sambal ladies fingers, black pepper brinjals, scallops, clams and other seafood. The mango juice stall is popular. In the shop you can buy items like Sharon's Traditional Homemade Melaka Portuguese Pickles (mango or fish flavour). Very tasty! 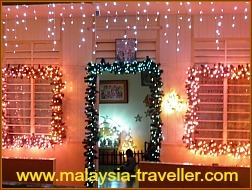 The museum is a modest collection of items which trace the history of the Portuguese community in Malaysia. Over the years this population has dwindled and many have sought new lives in places like UK and Australia (particularly Perth). 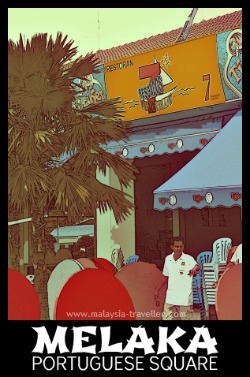 The location is marked on the map on the Top Melaka Attractions page. 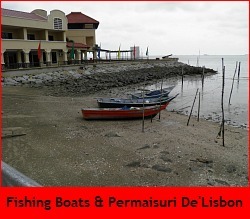 A new 3 star hotel, the Permaisuri De' Lisbon, was built on the reclaimed waterfront a few years back. 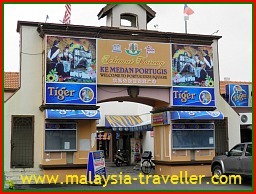 It is convenient for the Portuguese Settlement Melaka but probably would not be my first choice for a Melaka hotel. I'm not sure if this hotel is still open to the public. When I revisited in December 2012 it appeared to have been transformed into Limkokwing University's Melaka campus. 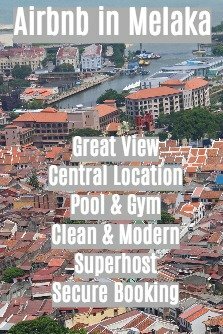 You can find other hotels by searching on Agoda's search box below.